Pour your best balsamic with gourmet flare and unparalleled presentation. 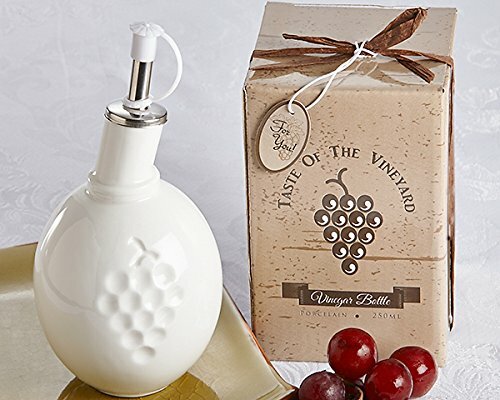 Our vineyard themed depressed grape design on this pure white porcelain bottle in grape shape will have your guests wanting more. Couple it with our "taste of the orchard" olive oil bottle for a match made in culinary heaven. If you're giving these out as wedding favors, they very well might steal the show from the bride and groom as a pair. As a party keepsake gift or for your very own use, the modern and organically inspired design will have your guests raving. Originally created by Artisan designs. Features:. If you have any questions about this product by Artisano Designs, contact us by completing and submitting the form below. If you are looking for a specif part number, please include it with your message.